Day four of the Homes for Heroes Twelve Days of Christmas took place in Daphne, AL where a displaced Vet family received $500 gift. Homes for Heroes real estate specialist, Auburn Howard, purchased gifts using $500 given to the Gonos family by Homes for Heroes. Christmas wishes came true when “big gifts” were placed under the tree for the Gonos children to open. Christopher Gonos is a local Veteran who served 8 years in the United States Marine Corps. During his service, he deployed on 2 Marine Expeditionary Unit (MEU) deployments to numerous international locations including Asia, Africa and the Middle East. In July of 2017, Chris left the Marine Corps and moved to New Bern, North Carolina with his wife, Ashley, and their blended family children Ellie, Alex, Luca, and Aubrey and Autumn. They would spend summers and holidays together. They eventually moved into a great home, with wonderful schools, in a community where they truly felt at home. They were ready to begin their new life after the military. Then Hurricane Florence happened. After less than one year into their new beginning, they received news Hurricane Florence was bearing down on the coast of North Carolina. Chris and Ashley packed up their family, pets, and everything they could fit into their vehicle and left for Alabama. They had family to stay with until the hurricane passed. When they left their new home and community behind, they didn’t know what they would find when they returned to New Bern, NC following the storm. When residents were allowed to return, Chris and Ashley made the trip back to New Bern to salvage what they could from the home they had come to love. Sadly, only a handful of their belongings remained in tact. Hearts broken they stood strong together, packed what they could salvage, and said goodbye to everything else. They now live in Alabama with family as they rebuild their lives yet again. Every holiday season, Homes for Heroes and their real estate and mortgage specialists collaborate with other local organizations to deliver their Twelve Days of Christmas Miracles. This year real estate specialist, Auburn Howard, was selected to present a $500 gift to the Gonos family. The family was invited to Howard’s office where Chris, Ashley and the children sat around the Christmas tree and opened their gifts. “The children all had a ‘big’ item on their wishlist. So in addition to other gifts, I made sure these ‘big’ items were under the tree for them. Seeing their faces light up was truly a gift and an experience I will never forget.” said Howard. Thank you to all who made this Christmas gift possible. And Chris, we all thank you for your service to this country. 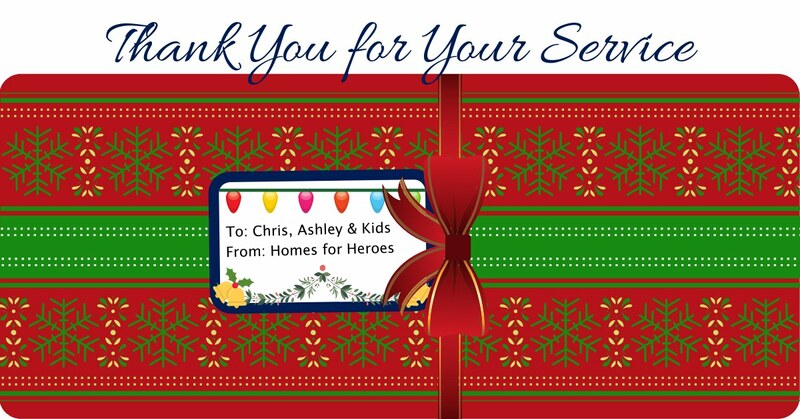 Happy Holidays and Merry Christmas to you, Ashley and the children from all of us at Homes for Heroes.